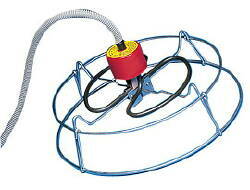 Sinking De-Icer rests safely on the bottom of the tank, and are so compact they will even fit in small buckets. Comes complete with a metal guard that makes it safe for rubber, plastic, or structural foam tanks and features a fail-safe shut-off system, should the tank run dry, as well as built-in thermostatic control. CSA and Underwriters Laboraties listed. 1000 watts. 120 vac.